Everyone loves a good sports movie. From Rocky all the way down to Whiplash, the story of a man pushing onward for glory in the face of desperation has not failed to get the crowds going so far. And like every age-old story, repetition gives rise to genre tropes and clichés which leave the film open to negative critique on creativity. 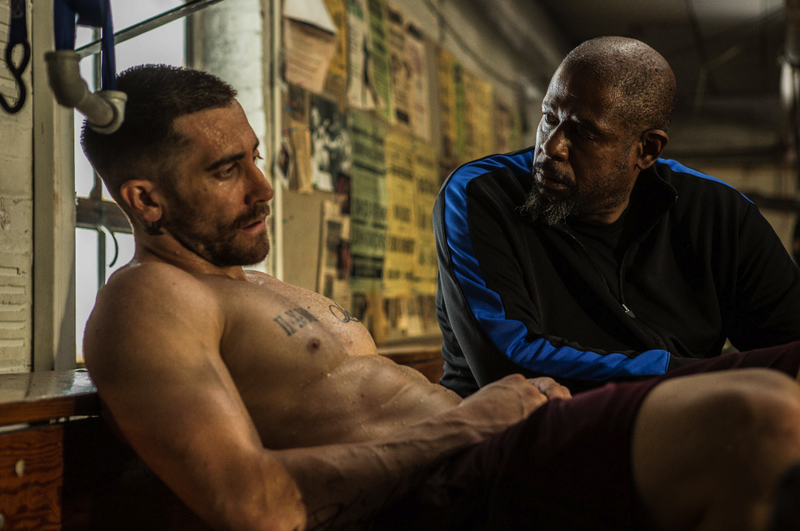 Antoine Fuqua’s Southpaw treads the road more travelled by, hitting all the elements that made Rocky what it is, but at the same time is driven forward with the raw acting powerhouse that is Jake Gyllenhaal. And just as any good boxing movie, the audience rides along with him through all, from the fall from grace to the training montage-induced resurrection. With an edgier and rawer central character, Southpaw fails to venture away from blueprints but focuses on making itself a fine addition to the genre. Billy ‘The Great’ Hope was raised in Child Services, where he struggled to make a break, found his wife Maureen and from which he rose to the title of World Light Heavyweight Champion. He lives with his wife and daughter in one of those mansions that indicate a fast rush to riches, and hangs out with his childhood crew. Billy is a Southpaw-stance fighter, meaning he uses his right hand for defence with the left ready for a hook-shot, but he is not a taker for defence which he substitutes with the endurance to take as much as he can. After an unfortunate incident involving a rival fighter, his wife gets shot in the confusion and then it is all downhill from there. He loses the motivation to get back up when beaten down in the ring, and as a broken man, starts to lose grip on his daughter and everything that was associated with Billy ‘The Great’ Hope. These are just for points of reference through the rest of this review, and no one who has seen any sports film need be told the plot – downfall, rage, desperation, redemption and a new trainer who’s quit the business in the form of Forest Whitaker, they’re all in the film. It seems there is something innately linked with the sports-genre that appeals to our own dreams and desire to overcome downfall through redemption. I mean, there must be some reason why no matter how many times we’ve heard the same story; our hearts latch onto the man who singularly takes control of his destiny by punching things. 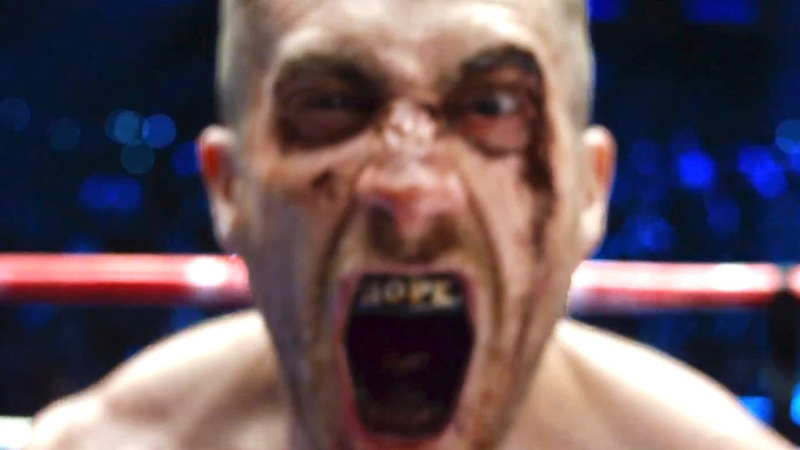 It is all the more fruitful therefore that such a character is played here by Jake Gyllenhaal, who is undoubtedly the greatest thing Southpaw has going for it. To make a character who on paper sounds like a short-tempered disoriented brute endearing and to have us cheering for Billy as he throws those final punches (come on, there are no spoilers in this film) is remarkable. Gyllenhaal has proved his depth of character acting and his immersion into the roles he takes on yet again; engaging us in what is otherwise an average story. His eyes have a peculiar intensity to them that fares well for him in movies like Nightcrawler, Prisoners, and yes, now Southpaw. The physical transformation and the routine he put himself through also need to be spoken for, which elevates his in-ring performances to a level of brutal realism. He epitomises the broken hero who traverses the path of redemption to arrive on top, and it’s entertaining as all hell. There are other players in this gritty Rocky reboot as well, and Rachel McAdams was spectacular in her part as Billy’s wife Maureen. From True Detective to now, her tenacious performance never ceases to amaze me. The scene in the hotel lobby alone is testament to the uncomfortable realism that she brings to her characters. Although there wasn’t enough room for her to show in this feature, it is incredible how easy it is to forget that these are actors when you see Billy and Maureen in a scene together. And the relationship dynamic which isn’t properly revealed until much later works into the rest of the film well, with every conversation or look they share reflecting his dependence on her. The girl who played their daughter, Oona Laurence is one of the less annoying child actors I have seen on screen, and her more intensive scenes toward the end only go on to show how much she gives to the performance with so much emotion resting on her. What got me the most about the cast in this film is that though stereotypical, this familiarity is muffled at least a little by the dark realism that is each of their pasts. Every performance carries some weight, and yet stumbles over the cardboard-cut characters. Leaving Southpaw, I cannot truthfully say I was dissatisfied, as there was not one moment that had me checking my watch or staring at my phone. What I can say however, is that I was disappointed in the sheer unoriginality of what was one of my most anticipated movies for this year. Trust me; if you’ve seen any good boxing film over the years, you already know the story of Southpaw. But that’s the thing, isn’t it? Boxing as a sport was never about innovation or originality; it was and always will be about the same old game played with sheer skill and force. In that sense, this film embodies the spirit of the sport, but that still does not rush to help when you can see exactly where the film is going. I have mixed feelings about this film, as I would never ask anyone to stay away from it, and yet it wouldn’t be at the tip of my tongue if I were to recommend someone a film from this year. It may not be wrong to say that Southpaw is one of the best boxing films I have ever seen, but is that enough? Perhaps the subgenre of boxing films is limited in originality by definition. All these are doubts that will remain unanswered until something unique comes along. This entry was posted in Drama, Movie Reviews, Sports and tagged 2015. Bookmark the permalink.